At Acucraft, we love hearing back from our customers and receiving photos of their finished fireplaces. 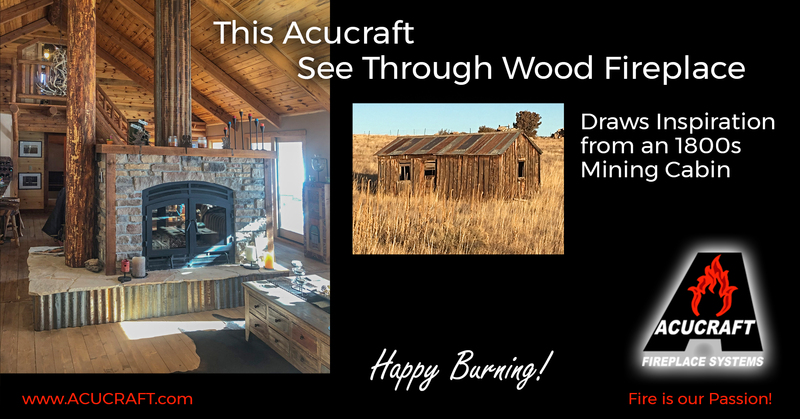 This week we received photos from Ed, an Acucraft customer who recently built a home in the historic mining area of Silver Cliff, Colorado. The photos showcase Ed’s finished Acucraft Hearthroom 36 See Through Wood Fireplace. While the fireplace itself uses state-of-the-art wood burning technology, the trappings surrounding the fireplace connect it with the land’s rich history and give it a rustic look. Ed’s story began last year when he contacted Acucraft Fireplace Advisor Mark Kennedy who is knowledgeable in wood burning fireplaces and log homes. Ed shared his unique fireplace idea. He wanted a See Through Wood Burning Fireplace for his new Colorado home. Residing on his property was an old 1800s mining cabin, and Ed desired to re-purpose elements from this cabin into the design of the fireplace to give it rustic charm and character. So portions of the cabin’s old steel roof were used as a surround to wrap around the base of the fireplace hearth and the Class A Flue. Now that the Acucraft fireplace is complete, Ed says, “I’m loving it!” The fireplace makes an excellent contrast from the living area and the dining room as the focal point of the entire open space concept. His friends, family and even the builder had a hard time envisioning Ed’s see through fireplace idea at first, but now that it is complete, “They’re all eating crow now!” says Ed. An Acucraft wood burning fireplace offers both rich ambiance and wonderful warmth. Ed’s completed Acucraft Hearthroom 36 See Through Wood Burning Fireplace showing both sides and angles. Thank you Ed for sending us photos of your finished Acucraft Hearthroom 36 See Through Wood Burning Fireplace. It looks amazing! We hope you, and your crow eating friends and family enjoy your fireplace for many years of happy burning! Do you have a unique fireplace design idea? Let our Acucraft Fireplace Advisors and Designers make your fireplace dreams come to life. Call Acucraft Toll Free at (888) 317-6499 or info@acucraft.com. Ed’s Acucraft Hearthroom 36 See Through Wood Fireplace is built tough to last a lifetime with seven-gauge steel and then crated and delivered to his home. Proudly made in Big Lake, Minnesota—known for its hardy winters—Acucraft Fireplace Systems has mastered designing, engineering, and manufacturing wood fireplaces for over 40 years and have created the ultimate wood heat systems and ambiance for you—our customer. While other fireplace manufacturers mass-produce one fireplace a thousand times, Acucraft builds every fireplace every time. That’s what makes us unique. Acucraft is the first custom fireplace design manufacturer in the world who works with you one-on-one to make your fireplace ideas a reality. Whether you are an Architect, General Contractor or Home Owner, our Fireplace Advisors and Designers provide you with a world-class experience to exceed your expectations. Acucraft delivers innovative solutions, revolutionary designs, uses the highest quality materials and components, and meets lightning-fast response times. Acucraft builds the best wood fireplaces on the market using heavy, seven-gauge steel. We provide you with a high-quality, high-performing, and safe wood burning fireplace and back it with the Acucraft Lifetime Guarantee for a lifetime of Happy Burning! Call Acucraft Toll Free at (888) 317-6499 or info@acucraft.com.